**This is meant to be a chunky applesauce – so you don’t want it mushy. Remove from heat while Granny Smith apples still have a solid form! If you make this and want it for another recipe, you’ll need to hide it in the frig – it tastes like pie filling! 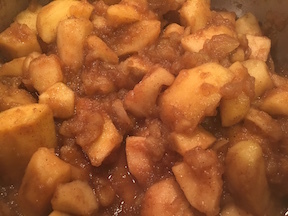 Making your own applesauce is well worth the effort! Use this with my Apple Ginger Cinnamon Cake Recipe, or as topping on my Apple Spice Muffins (gluten free).